"Some of the best moments from our World Cup win were seeing young girls imitate us on the sidelines," says Knight. "Hopefully many more will be inspired by this competition." 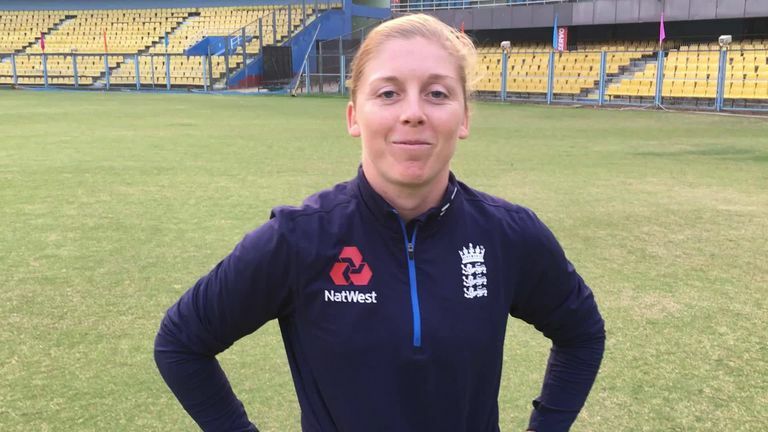 The ECB has linked up with the nine first-class counties hosting England Women internationals in 2019 to give 11 girls a chance to train with Heather Knight's side ahead of the Ashes. The #HeathersPride competition, which was launched on International Women's Day (March 8), is open to girls across the country aged between 7-11 with entry closing on May 1. The nine counties hosting England Women's games this summer - Derbyshire, Essex, Gloucestershire, Kent, Leicestershire, Northamptonshire, Somerset, Sussex, Worcestershire - will select a winner each, with the remaining two winners selected from across England and Wales by England skipper Knight as 'Captain's Picks'. Entries will be made via social media (using #HeathersPride) or via email - those applying through their counties should see their respective county's website for further details. Those without a connection to one of the nine host counties this summer, can apply for a Captain's Pick by emailing supporters@ecb.co.uk with the subject #HeathersPride. England and Australia's Ashes series, which will be held between July 2 and 31, will comprise three one-day internationals, a one-off Test match and three Twenty20 internationals. "Some of the best moments from our win in the 2017 World Cup was seeing young girls imitate us on the sidelines and hopefully many more will be inspired by this competition to become part of #HeathersPride. I can't wait to see all the winners in the summer!" said Knight. "International Women's Day is a great moment to reflect on the progress of women's and girls' cricket. We've made so much progress over the last few years and we want to keep moving forward. "At the very top, we're pushing towards more depth and having more professional players while it's amazing that more and more girls are playing the game through initiatives like All Stars. "Chance to Shine also celebrated introducing cricket to its two millionth girl this week. It's exciting to think of how many girls are now choosing cricket." International Women’s Day is a great moment to reflect on the progress of women’s and girls’ cricket. We’ve made so much progress over the last few years and we want to keep moving forward. Clare Connor, who was appointed as the ECB's managing director of Women's Cricket in January, added: "Our strategy for 2020-24 is all about inspiring future generations and this is a great initiative from Heather and the counties to really bring that to life by giving 11 lucky girls the chance to train with their heroes for the day. "Whilst International Women's Day is an appropriate day to celebrate the progress made so far it's also important to recognise the challenges we still face in our ultimate ambition of making cricket a gender-balanced sport. "Heather's and the team's victory at the 2017 World Cup created a huge opportunity for us and now we must take that to the next level through this strategy. "As all of that exciting work takes shape, I'm looking forward to seeing the training session with the 11 winners of Heather's Pride and the England women's team this summer." Watch the Women's Ashes live on Sky Sports Cricket this July.